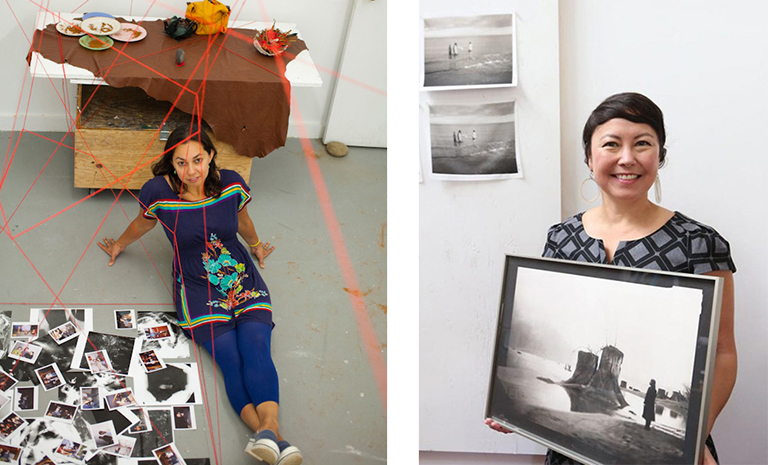 Please join us for an evening conversation with exhibiting artists Mercedes Dorame and Tomiko Jones, moderated by guest curator Ann Jastrab. Westward, located at San Francisco City Hall, is an expansive exhibition featuring women photographers focusing their attention on the American West, subverting notions related to the masculine conceit of Manifest Destiny. This conversation will bring together two artists that think deeply about history, land and belonging. Tomiko Jones, who just relocated from the Bay Area to assume the role of Assistant Professor of Art at University of Wisconsin-Madison, creates videos and “questionably fictional” photography that are “linked to place, exploring transitions in the landscape in social, cultural and geographical terms.” Her work in Westward are both quiet and powerful, tracing the line between land and water, and perhaps between being awake and dreaming. Note that Westward is on the ground floor of City Hall, and this special program takes place across the street from City Hall in the Veterans Building, Room 125. Seating is limited, so please arrive 15 minutes early.